At some point everyone reaches a point in their life when they want to step out of their comfort zone and do something different, even if it is something small. 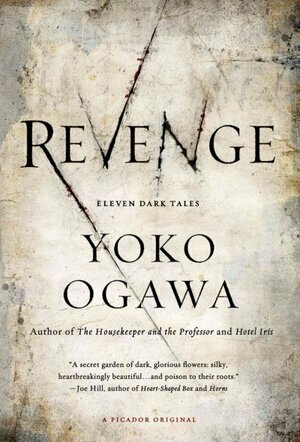 In my case one such point came about when I began reading a psychological horror novel titled Revenge: Eleven Dark Tales by Yoko Ogawa. I tend to tread lightly when it comes to the horror genre in any medium of entertainment, but finally stepping into the shadow and coming out the other side grinning is a huge first step. Revenge is a novel consisting of eleven short stories (hence the title) interwoven with characters, settings, subjects, and sometimes a single word. Mrs. Ogawa does an immense job with spinning absurdly dark tales and developing characters in these tightly packed short stories. She is able to do this by peppering these stories with small moments of character and just the right amount of intensity throughout, stringing you along for the rest of the ride. The downside is that there are some tales that are just filler, only to make a connection with a character earlier or begin the development of a new one. These small instances of filler are otherwise of the only drawbacks to this collection. Having not read any of Ogawa’s previous work, I could still tell the experience she had with short stories. The amount of detail and images she is able to convey with such a small word count is impressive. For example picturing a heart on the outside of the body, and explaining the workings of it all, while still setting that dark ominous tone in only a few sentences. Another instance being when a mother discovers that her child has died, and following the mothers train of thought as she tries to die like her son did. It left me sympathetic while a chill crept up my spine.